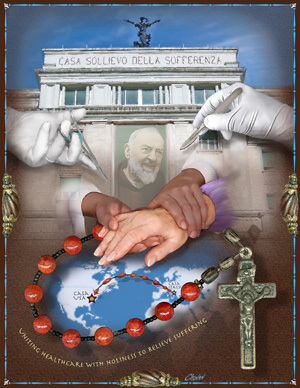 Catholic Healthcare International was incorporated in July 2004 on an inspiration from Padre Pio to be the vehicle to implement this vision. 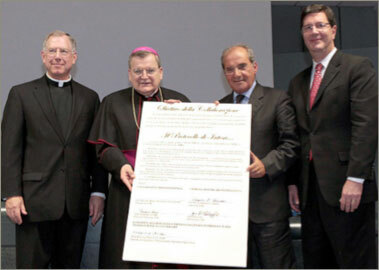 After several years of prayer, discernment, preparation and foundational work, a formal Collaboration Agreement was signed on October 1st, 2009 with the Casa Sollievo della Sofferenza to begin the work of duplicating Homes for the Relief of Suffering around the world. Duplicate Padre Pio’s Home ForThe Relief of Suffering in the United States and other areas around the world. Emulate the structure, name, operation, organization, etc. as closely as possible to that of Padre Pio’s Casa. Maintain absolute loyalty to the Magisterium of the Catholic Church. Operate the new network of Casa’s as “Clinics for the Body & the Soul” for our “guests” (From the words of Padre Pio). Ultimately, it is the goal of this Collaboration Agreement to duplicate the model of Catholic healthcare, executed so successfully by Padre Pio and his successors, for those in need of relief from suffering in various other areas of the world.